Craft Cocktails At Home — No Mixing Required! With a slew of talented mixologists in Chicago, ordering a simple vodka soda is simply a crime. But what happens when you prefer a night in? Toss that wine opener, ladies, because now you can enjoy a libation that rivals one from the city's hottest bars — and restaurants. If you've ever had a drink at The Drawing Room, then you're familiar with James Beard Award-winning bartender Charles Joly's creative concoctions. Well, Matt Linder (the brains behind the boozy biz) developed Crafthouse Cocktails, the next best thing to having Joly in your home. There are two delish flavors to choose from (so far), which include the Moscow Mule (vodka, ginger beer, and lime) and the Southside, made up of gin, lime, and mint. There's never been an easier way to add a little life to your next barbecue, event, or heck, Friday night at home. 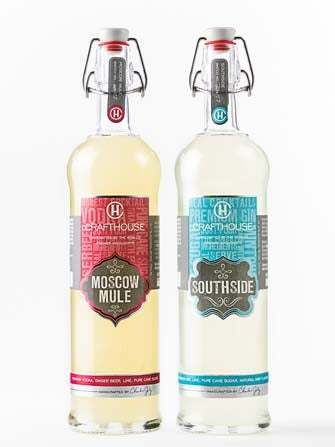 Each ready-to-serve bottle of Crafthouse Cocktails contains six servings and can be purchased at Binny's, Olivia's Market, and The Goddess and Grocer for just under 20 bucks — quite the bargain for several culinary cocktails if we do say so ourselves.